Koochiching County’s coverage is 68 percent at speeds of 25/3 and 100/20 (Mbps down/up) . The access they have is good, they just need more of it. In 2014, coverage was 74 percent but broadband was defined at a slower speed. 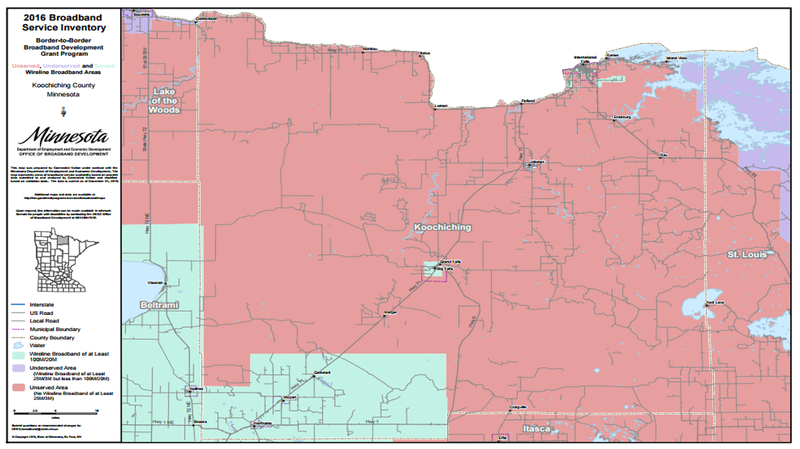 In 2015, Mediacom received $$27,448 to build out broadband middle-mile infrastructure between Little Fork and International Falls. The project was designed to bring high-speed service to 258 Internet users. Koochiching is served in part by Paul Bunyan. So upgrades in their GigaZone service will help but only in areas they serve. Koochiching County is also in line to receive $950,823 in CAF 2 funding to upgrade 1,829 locations. CAF 2 recipients are only required to upgrade to 10/1 access. Many may choose to upgrade to better speeds but there are no requirements. DDI score of 51.79 out of 100. There is a matrix of Minnesota broadband adoption projects; it includes projects from this area.